New Braunfels aerial photography, drone photo and video, and ground or architectural photography, in New Braunfels, San Marcos, San Antonio, Comal County, Texas. Red Wing Aerial Photography is New Braunfels' experienced and trusted source for professional custom aerial, drone and ground photography. From New Braunfels to San Marcos, Austin, Seguin, San Antonio and all points in between--we've got the experience and aircraft to do it! With over twenty years of experience supporting the commercial real estate and construction industries, we know how to effectively showcase your property for sales brochures, presentations, site reconnaissance or construction progress photos--We understand what you're trying to accomplish! 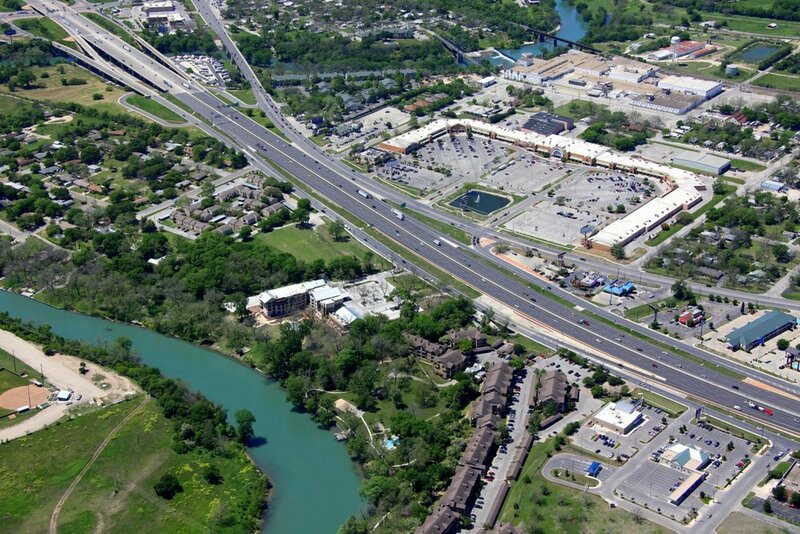 Commercial real estate brokers in New Braunfels appreciate our quick turn around time and professional digital aerial photography at competitive rates. Give us a call at 210-828-5366 to discuss your next project! Aerial drone photography can add a fresh new perspective to your marketing collateral. In addition to your standard package of ground photos and higher altitude aerial "market shots", low-altitude drone-based aerial photography can complement your marketing package with more intimate "glamour shots", giving your marketing materials a more comprehensive look. Red Wing Aerials is fully licensed and certified under FAA Part 107 and can help you with drone-based aerial photography anywhere in the New Braunfels area where it is legal to do so. Click here to learn more about our drone photography and videography services. Why hire a separate photographer to perform ground photography of your property? With any aerial or drone photo package, we can provide a comprehensive ground photo shoot of your New Braunfels area property, exterior, interior, day or night. Or, if you already have your aerial photos, order ground photography as a stand-alone package. Click here to learn more about our architectural/ground photography services. New Braunfels is located 32 miles northeast of San Antonio and serves as the Comal County seat. With a population of 70,543, New Braunfels is home to Schlitterbahn Water Park and a Wal-Mart regional distribution center, both major employers. New Braunfels holds "Wurstfest", a German-style sausage festival, every November, drawing on the city's strong German heritage. Every December, New Braunfels celebrates Wassailfest in the historic downtown. New Braunfels draws a large number of tourists, particularly in the summer because of the cold-spring rivers that run through the city. We fly the New Braunfels-San Marcos area on a regular basis as well as the markets listed below.